Posted on Mon, Apr 9, 2012 : 5:58 a.m. The quest to renew Ann Arbor's parks maintenance and capital improvement millage has begun and city officials are getting the word out far in advance of the Nov. 6 election. The city has launched a new section on its web site at www.a2gov.org/parksmillage, which is devoted to the upcoming expiration of the millage and the renewal vote. The parks millage is a six-year property tax levy of 1.1 mills that was last approved by Ann Arbor voters with 60 percent of the vote in November 2006. The millage expires later this year. According to information provided by Parks Manager Colin Smith at a recent Ann Arbor City Council work session, the millage costs the average homeowner $117 a year. That's using the city's median home value of $213,000. 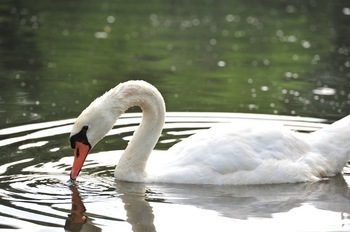 A swan lingers in the Huron River near Ann Arbor's Gallup Park last summer. The new web page provides background on millage-funded activities and a variety of other resources, including fact sheets and related meeting footage links. The city's Park Advisory Commission and parks and recreation staff are inviting members of the community to attend any one of a series of public meetings to discuss the millage. At each meeting, a presentation will be given that provides a short background on how the millage is used by the city's park system, an explanation of how the park system is funded, and information regarding the proposed millage renewal process. Monday, April 9, 6:30-7:30 p.m. — Ann Arbor Senior Center, 1320 Baldwin Ave. The millage generates about $5 million in revenue each year. According to data provided by the city, between 60 percent and 80 percent of the annual millage funds support city park maintenance activities, including forestry and horticulture, natural area preservation, park operations, park equipment repairs and park security. Between 20 percent and 40 percent of the annual millage funds support capital improvements in the following areas: active parks; forestry and horticulture; historic preservation; neighborhood parks and urban plazas; pathways, trails, boardwalks, greenways and the Huron River watershed; recreation facilities; and park equipment acquisitions. Some of the money (about $70,000 in the last four years) also is channeled to the city's public art program to pay for projects such as the sculptures installed in West Park. City officials say residents unable to attend any of the public meetings are welcome to email their thoughts to a2parks@a2gov.org. The city's Park Advisory Commission is expected to hold a public hearing on the millage renewal on April 17 and later make a recommendation to the City Council, which must vote to put the millage renewal on the November ballot. The city's parks millage is one of nine separate property taxes the city levies, including 6.17 mills for general operations, 2.06 mills for employee benefits, 2.47 mills for refuse collection, 2.06 mills for public transit, 1.99 mills for street repairs, 0.48 mills for open space and parkland preservation, 0.15 mills for debt service and 0.125 mills for sidewalks. Added up, that's about 16.6 mills worth of taxes levied by the city, which costs the average homeowner in Ann Arbor nearly $1,800 a year. That represents about a third of the taxes levied in Ann Arbor — about two-thirds of every property owner's tax payments go to other entities, including schools, the county, libraries and Washtenaw Community College. Mon, Apr 9, 2012 : 10:08 p.m. I like the parks, so how can I object to paying for them? Voting down the millage will cut my own nose off to spite my face without conveying any specific message to the powers that be. Better all dissenters should show up at city council meetings and express their real feelings (about buckets and fire stations and parking) than rely on an up/down parks millage vote to communicate with the mayor. Mon, Apr 9, 2012 : 10:19 p.m.
Much precedence shows they dont hear conflicting voices so what's the point? They do see dollar signs just fine like all greedy power brokers. Mon, Apr 9, 2012 : 8:27 p.m. I love our parks but it is time that the rest of the residents of Ann Arbor pay for the parks. I do not believe that the property owners should be the only ones that pay for the parks or any other service provided by the City of Ann Arbor. Less then half of Ann Arbor is taxable which means that I and everyone else that owns property is supporting the rest of the City of Ann Arbor. PROPERTY TAXES ARE EVIL. Mon, Apr 9, 2012 : 8:10 p.m. I forgot to mention one other thing. If the millage passes, can we get guaranteed minimum service levels? For example, the park in my neighborhood gets mowed every 19 days. After about 10 days during nice weather, it's hard to use for small children, or to kick a soccer ball, or whatever, because the grass is just too tall. If we are paying $5 million a year for parks, can't we hire some private contractors to mow the grass for us on a regular basis? Mon, Apr 9, 2012 : 6:08 p.m. I think some of you are missing the point. Most of us agree that we have great parks and are willing to support them. Unfortunately history has shown that so long as people are willing to support and pass millages, Hiefte and his cronies will continue to find ways (using &quot;buckets&quot;) to defund items out of the general tax revenue. He can they cry, but X thing doesn't have any money, the citizens will have to come up with the money if they care about it. Most of you will blindly do it and then they can fund their pet plans, i.e the big dig, the urinal, the train station with money they always seem to be able to find when they want to. Stop supporting the millages and support some accountability in AA. Mon, Apr 9, 2012 : 5:48 p.m.
Mon, Apr 9, 2012 : 3:51 p.m. I plan to be a no vote on this one as well. In a fund-based accounting system, people tend to get upset when you designate money for a certain fund and then it is siphoned off by some trickery into another fund. The 1% for art is just that kind of thing. It lacks integrity. It may be legal, but it is not ethical. It would probably be a good thing for someone to challenge the city in court on this. That would eat up a lot of the 1%, wouldn't it? As far as not using the parks (sh1, et al. ), I won't make such a proclamation. I have already offered the city to BUY one of the parks, maintain it, and keep it as a park. That kind of public-private partnership would allow me to vote no and still use the parks without being two-faced about it. Mon, Apr 9, 2012 : 5:36 p.m.
Mon, Apr 9, 2012 : 3:50 p.m.
How many other millages have the sneaky &quot;% for art&quot; attached? It's unfortunate the parks millage is coming up now, considering the volatile atmosphere. However, until city government gets it's priorities straight, I'm inclined to vote anything down that has &quot;% for art&quot; attached, even a park millage renewal. Mon, Apr 9, 2012 : 1:52 p.m. I hope those proclaiming they will vote &quot;No&quot; are also willing to proclaim they will not make any use of the parks. Okay, so I get this right: you want to use the parks, you just want other people to pay for them. Got it. Mon, Apr 9, 2012 : 5:42 p.m. So sh1 wants to tie basic civil rights to how we vote? that makes as much sense to suggest only people who actually pay property taxes should be allowed in the parks. Mon, Apr 9, 2012 : 5:32 p.m. Right, sh1, because people who believe in fiscal responsibility shouldn't use parks. That makes sense. Mon, Apr 9, 2012 : 5:01 p.m.
and yet you assume anybody who doesn't fall in step with you is lazy? Mon, Apr 9, 2012 : 3:17 p.m.
tdw, I already had a nice 18 mile morning bike ride. Mon, Apr 9, 2012 : 2:47 p.m.
Get off their couches ? as you make your fourth post ? Mon, Apr 9, 2012 : 2:21 p.m. Interesting question. I myself am wondering whether they will even get off their couches, away from the internet, and into the great outdoors. Mon, Apr 9, 2012 : 1:39 p.m. This is where we can make a stand, NO MORE money to things not as important as public safety! Send a message, vote NO!! I will! Mon, Apr 9, 2012 : 5:10 p.m. It's not about &quot;how much&quot;, it's about where and how it's spent. As far as I'm concerned, one of the BIGGEST wastes of money is on the waaaaaay tooooo many parks in this town...that, like bike lanes, very few people use. Back in better AA times, the few parks we had, had ice rinks, summer kid programs etc. Can't even begin to fund that nowadays due to the ridiculous amount of what are termed &quot;parks&quot; as well as wasteful spending on things like (cough, cough) &quot;art&quot;. There comes a time when &quot;enough is enough&quot; we are at those times. Mon, Apr 9, 2012 : 2:20 p.m.
How much money must be spent in order for you to feel &quot;safe&quot;? What city would you cite as having ideal public safety? Any with large univerisities? Any in Michigan? How will that improved safety actually manifest? Don't you think there will always be issues with public safety, and that it is a problem that can never actually be solved? Should we sell all of the parks to fund this &quot;safety&quot;? Mon, Apr 9, 2012 : 1:21 p.m.
What bothers me about the council's spending are their efforts to give the University of Michigan our parkland, free of charge. And to build the UM a parking lot on our parkland. All while calling it some kind of silly high speed train station. The comedy continued because the agreement did not reserve sufficient parking space for a train station - the majority of it was locked up by UM. I support the 1% for art. It just needs to be managed better and the art needs to stop being shamelessly squandered in government buildings. &quot;Some of the money (about $70,000 in the last four years) also is channeled to the city's public art program to pay for projects such as the sculptures installed in West Park.&quot; This information should be listed on the ballot AND the City Attorney should provide a written legal opinion on the legality of using funds for other than what is listed in the proposal. It will save the City from an outside legal challenge. Mon, Apr 9, 2012 : 12:43 p.m.
Ann Arbor's excellent park system improves the quality of our lives. The parks provide a real laboratory learning environment for our children and adult students. Additionally, the parks contribute positively to our economy. The park system is well-managed and maintained. The tax is reasonable, so I will vote yes. Mon, Apr 9, 2012 : 12:19 p.m. I have 5 bucks that says the voting is going to get goofy pretty soon. What time does city hall boot up our computers? Mon, Apr 9, 2012 : 12:54 p.m.
Be prepared for your own thumbs down---I got tons when I suggested something similar on the Main Street corridor story, LOL. Mon, Apr 9, 2012 : 12:18 p.m.
add me to the crowd with serious concerns about the city peeing away my/our tax dollars. In a different time I vote yes without hesitation, not any more. Mon, Apr 9, 2012 : 12:17 p.m.
Ditto. I will vote no on every single millage as long as the percent for art program exists. Mon, Apr 9, 2012 : 12:08 p.m. So, would this be the bucket that gives farmers in Dexter money? or Would this be the bucket that gives &quot;artists&quot; in Germany money? A big NO from me unless somehow City Council does something to show me they have a chance of acting fiscally responsible form now on. Repealing the Percent for Art program and returning that money to whence it came would be a good start. Mon, Apr 9, 2012 : 11:14 a.m.
NO! NO more millages that include funneling out $$$ for art installations! Revoke the Percent for Art. Spend money on public safety and roads. Send a message: Vote Hieftje OUT! Mon, Apr 9, 2012 : 11:13 a.m.
Having vibrant and healthy recreation areas is definitely worth $10 a month to me. Mon, Apr 9, 2012 : 11:42 a.m.
And is to me also which is why i voted for it last time. Since then i am no longer comfortable with how this administration plays bucket shenanigans and handles our money. Until they stop and resolve the many issues discussed on this blog previously, i hope my fellow citizens with voting both literally and with their wallets. Mon, Apr 9, 2012 : 10:39 a.m. I agree - no more voting for taxes until the city becomes fiscally responsible with their spending. Mon, Apr 9, 2012 : 10:29 a.m. Wed, Apr 11, 2012 : 5:20 a.m.
Ron I thought and it seemed others agree that I was pretty clear but allow me to try harder. I am unhappy that the mayor and his cronies continue to steal money from services and departments tha we cherish in order to fritter the money away on ridiculous and unnecessary things. Because he knows that responsible but uninformed Ann Arbor citizens will then pony up for their cherished programs. Until the administration stops STEALING from us, I and I hope others like you might take a stand by no longer funding him. Does that help? &quot;Let's hold the parks hostage and let them fall into disrepair&quot; Works for me. &quot;by any means necessary&quot;, as they say. Maybe somebody will wake up and smell the coffee if an ox FINALLY gets gored around here. They would be scrambling to put the toothpaste back in the tube so fast it would make your head spin. Hizzoner Major Lefhtie would be drilling holes in those buckets by the end of the day. Mon, Apr 9, 2012 : 1:17 p.m.
Yeah, that 1 percent for art is just too much. Why, that's $1.17 for art out of the average $117 everyone pays. Let's hold the parks hostage and let them fall into disrepair because you're unhappy about... What was it again?